Sometimes making a whole apple pie is just too laborious and risky for those on tight diets (i.e. leftovers!). These personal apple pies give just the right amount of sweet satisfaction following a savory meal. As of yet I do not know of any organic or all natural brands that offer frozen puff pastry, which I use in this recipe. So if approximately 36 hours hours of preparation is not for you (i.e. making your own from scratch), this would be an ok time to "cheat" a little. The frozen puff pastry that you can pick up in most supermarkets is super easy to work with and cuts a lot of cooking time out of the equation. This is a simple and fun recipe that will no doubt make you the apple of everyone's eye. Once the apples have marinated and oven is heated, remove apples from refrigerator and divide evenly amongst ramekins. 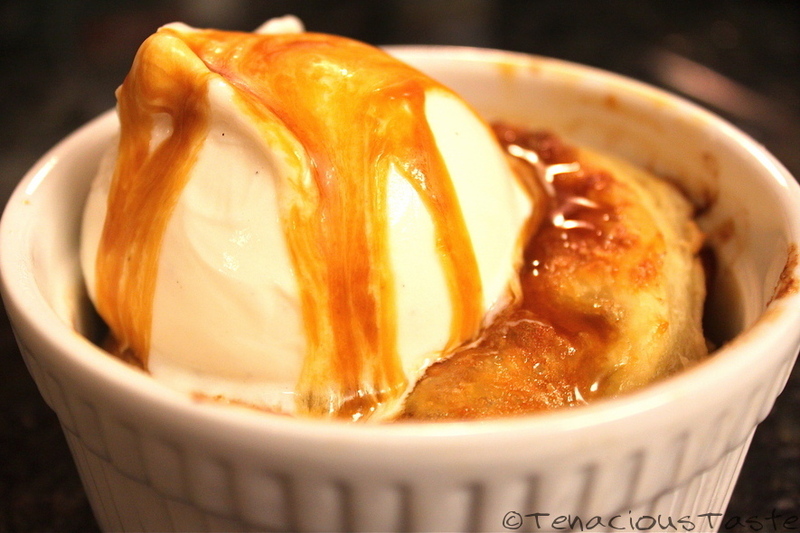 Serve with frozen yogurt and caramel sauce if desired! My local alternative grocery store offers several varieties of organic and all natural caramel sauces, but if you don't have that available you can make your own! Ina Garten's recipe, I have found to be the best! Just substitute organic ingredients! I use organic Golden Delicious apples for this recipe. They have a mild sweet honey flavor that melts in your mouth but other good types are Granny Smith and Pink Lady varieties that carry a bit more of a punch. For the honey, try to find a local brand in your supermarket. Local honey can help combat airborne allergies! I use tupelo honey that is made just 10 miles down the road from me. I am partial to Stoneyfield's organic frozen yogurt, but a great non-dairy alternative is SoDelicious. They make both soy and coconut varieties that taste just like the real thing! I agree with you...making a full apple pie is usually time -consuming and i am never able to finnish it. I like your idea of personalized apple pies and they look tasty too!